MHS culinary arts students place in competition. 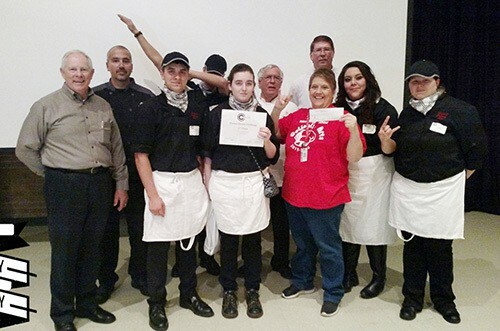 MARSHALL -Marshall High School Culinary Arts students attended a competition at Stephen F. Austin State University on April 15 and came home with a second-place finish in the “Mystery Box Challenge” event.MHS Culinary Arts, under the direction of Mrs. Dina Blaylock, finished second at the competition held as part of SFA’s Cooking Up Careers event. The second-place finish earned $200 in winnings for the MHS Culinary Arts program.Members of Culinary Arts team who participated include Tyra Carver, Andrea Palmer, Sean Perkins, Chris Rogers and Anna Vences.Congratulations to these students for their accomplishment and for representing MHS!